What is anterior approach hip replacement? Anterior hip replacement surgery is one type of approach that may be used during total hip replacement surgery. As with any type of total hip replacement, the surgery is used to improve the function of the hip joint and decrease or eliminate pain associated with hip arthritis. Over time, osteoarthritis of the hip and post traumatic arthritis of the hip can damage the bone and cartilage in the hip joint, leading to pain, dysfunction, and inability to continue day-to-day activities like walking and standing for a length of time. When symptoms of hip arthritis do not improve with conservative treatment methods, anterior hip replacement surgery may be a good option. 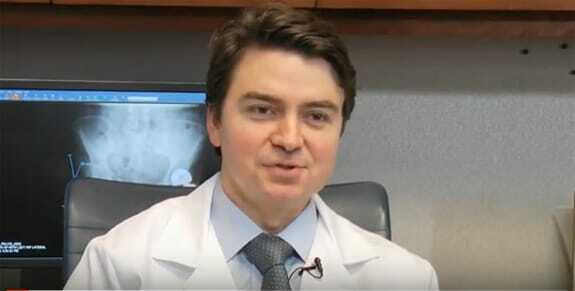 After a thorough evaluation, Dr. Sculco will recommend the specific hip replacement approach that is best suited for each patient’s unique needs. What is the difference between anterior hip replacement and posterior hip replacement? Anterior hip replacement and posterior hip replacement are both surgical procedures that aim to improve hip function by replacing diseased bone and cartilage with artificial implants. The main difference between the two approaches is the incision point, which is on the side of the hip during posterior approach surgery and is on the front of the hip during anterior approach surgery. The incision made with the anterior approach is designed to access the hip joint through a small space between the muscles surrounding the hip joint. Why is anterior hip replacement surgery used? What are the advantages of direct anterior hip replacement? For more information about total hip replacement, including information about the pros and cons of the anterior and posterior approaches, visit our total hip replacement surgery page. If you’re suffering from lowered range of motion and pain in your hip joint, the first step to getting back to your normal life quickly is scheduling an evaluation with an experienced orthopedic surgeon. Dr. Peter K. Sculco provides customized treatment plans and personalized care paired with world-class orthopedic training. Call 212.606.1771 today or fill out the form on this page to request an appointment.